These are pictures from the martini bar at the Mohegan Sun Casino in CT.
Notice how the lemon in the martini was calling me. Had I requested an additional twist, I'm sure it would have neatly folded itself into a "J" . Oh you taunt me so. I'm alllll about a good Martini, CJ. 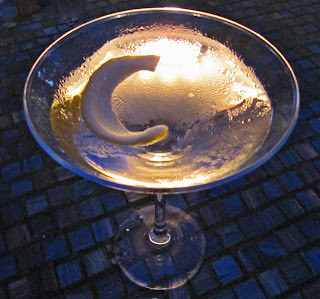 A Dirty one made with Tanqueray and a breath of Vermouth...mmmmm,mmmmm good! 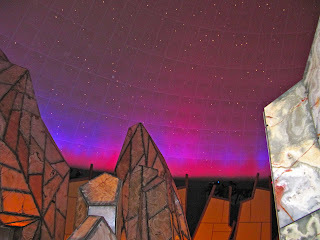 I love it up there in the ice mountain looking at the stars. The alcoves are cozy too. Nothing like sitting back and relaxing with a good martini Solo. I don't like olives - so I tend to go for the more "pseudo martinis" - the one in the picture is a pear flavored one. Isn't that place cool Chewy? It's like you are up close to the stars. I really like having a cocktail there.